I’m not going to repeat the blurb, basically the book’s plot is centered around immigration and repatriation. A group of young people from a small Mexican village sets out for America to bring men back to their small town. I am reading it for a book club and I picked up my copy from the library. Into the Beautiful North includes bits and pieces from several story types, romance, buddy story, road trip story, women’s fiction, YA, parable, political statement and thriller, although you never get to the “thrill” part. The book seemed to suffer an identity crises. There was not enough of any one genre to satisfy me as a reader. The girls’ characters felt flat. In contrast, some of the men were cartoonish in their extremes, which could work in a parable, but not so much in romance or women’s fiction, and we never see a resolution to the the thriller part of the plot. The road trip is somewhat monotonous and the political statement is very shallow, just a cursory overview of the issue. No real depth there. 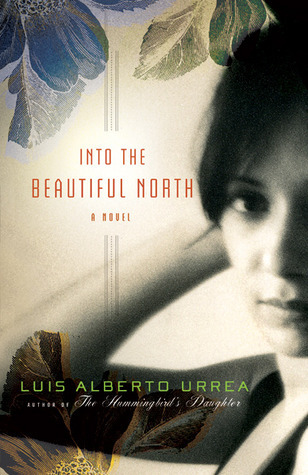 Urrea does excel at description of place and his prose is clear and engaging. I did enjoy that about this book. It was a quick, very easy read, struck me as something one would read in high school, thus the YA reference. The main theme of the book was love in all its forms and it presents some very positive messages in that light.